The new Davidson Online website was launched thanks to a transformational gift by Sami and Tova Sagol. Davidson Online is an interactive website designed to reinforce learning by enabling users to interact with instructors, teachers, scientists and peers, using educational games, puzzles, articles and automated learning systems and multimedia applications. It provides scientifically accurate online science information and activities aimed at supplementing classroom teaching and providing enrichment in fields of science and math. Geared toward the general public interested in science and technology, the website is a part of the Davidson Institute’s broad outreach to advance science literacy among school-aged children and the public as a whole. In addition to providing scientific material and information, the website is designed to ignite curiosity and scientific thinking. Its content is either developed by Weizmann Institute scientists, doctoral and masters' students, and Davidson Institute's staff and experts in science education, or brought by them from other, verified scientific databases. "Ask the expert" – surfers are given the opportunity to ask Weizmann and Davidson scientists questions and get a clear, coherent and accurate answer. "The math cycle" – a section dedicated to recreational math, puzzles, and riddles. 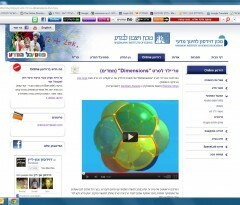 "Scientific Multimedia Archive" – An archive of scientific multimedia from the Internet, translated into Hebrew and annotated by Weizmann and Davidson scientists. "Science at Home" section – an archive of "do-it-yourself" experiments presented through videos that encourage students to explore science in and around their homes and neighborhoods with a series of simple, yet inquisitive and informative experiments.